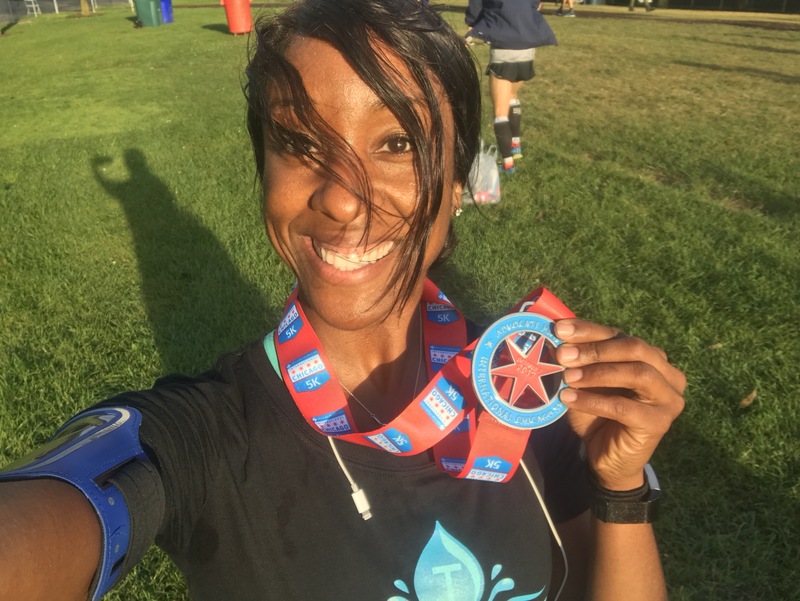 Race season is upon us and this weekend I was in Chicago for to support my friends and clients who ran the 40th Anniversary of the Chicago Marathon. I participated in the International Chicago 5K and had a great time. I wanted to share some tips to help those who are new to running, especially marathons, to help with the recovery after your race. Immediately after completing your race, think “REPLENISH”, this means immediately drinking some water and eating a piece of fruit. This is the best way to give your body exactly what it needs – hydration and carbs – since these have been depleted during the run. It will give you a quick boost of energy and let the body know that everything is okay. Also, make sure that you don’t stop moving your legs – walk around and focus on bringing your breath to a normal resting state, take anywhere from 5 – 15 minutes doing this until you feel like your legs and breath are stable. Lastly, doing some static stretches will help, especially focusing on your quads, hamstrings, calves, and hip flexors. When you’re home, an ice bath to help the muscles recover can be a great way to start the recovery process, but if you can’t stomach submerging yourself in a tub of ice, placing ice packs on your feet, ankles, shins, knees, and quads can definitely help. The next couple of days following your race, chances are you will be pretty sore, especially if you are new to running, so I wanted to share some Recovery tips for you to use for the first few days after your race to help you feel better and ensure that you are ready to start running and training for your next race! Foam Roll and Stretch: I’d recommend holding off from a deep tissue massage for the first few days after your race, especially a marathon. Instead, Foam Rolling can be a great way to release adhesions in the muscles and give you an opportunity to target certain areas that are extremely sore or where you are experiencing tightness. To properly foam roll, identify the area that is sore and roll across the area (1 – 3 inches) back and forth for at least 30 seconds before moving on to the next area. I know that this is probably going to be uncomfortable, but the more you do it the better you will feel. It is also great to do before your runs and aids in injury prevention and rehabilitation. Hot Baths with Epsom Salt and Baking Soda. About an hour before bed (and right after you foam roll), soak in a hot/warm bath with 3 cups epsom salt and 1 cup baking soda for 10-15 minutes. I like to add a few drops of essential oils like lavender or peppermint. The warm bath helps to soothe and relax the muscles, while the epsom salt and baking soda aids in flushing out the lactic acid in the muscles and regulating the skeletal muscle and nerve functions to help with recovery. Healthy Diet of Protein, Complex Carbs, Fruits & Veggies: Our diets play a huge role in muscle recovery, so ensuring that you are not loading your body with tons of excess salt, sugar, and preservatives post a race is key. The protein and complex carbs will help repair and rebuild the muscles, the fruits and veggies will add extra doses of nutrients, vitamins, antioxidants to combat free radical damage and boost the immune system. Drinking a meal replacement shake, like Shakeology, can also be a great addition to your post race recovery plan. Hydration: Our bodies are primarily made up of water and proper hydration is key to help support the muscles ability to recover. I recommend adding Alkaline water to the mix. It’s properties make it a rockstar because not only does it help with reducing the acidic levels in the muscles, but the higher hydrogen levels also helps with combating oxidative stress and inflammation of the muscles. My go to has been using the Tyent USA Water Ionizer. I remember the feeling after completing my first race, it was a mix of excitement, pride, and complete exhaustion and the thought of doing anything related to fitness or running was so far from my mind. However, I made sure that I followed the tips above and within a few days, I was back out running and getting ready for my next race! Good luck on your training and I’d love to hear more about your training race prep and post race recovery strategies and techniques – send me a message! Previous postAre you too Acidic? Try increasing your Alkalinity!